Significance : It is one of the greatest and most important Gompa in Ladakh. Popularly known as 'Hermit Kingdom' Ladakh, which is northeast region of Kashmir, is a picturesque region is a land of snow carved peaks, barren terrain, lakes and mystic culture. Located at a height of 14,000 feet, Ladakh also known as the roof of the world. Like Tibet, it is one of the last strongholds of traditional Tibetan Buddhism. 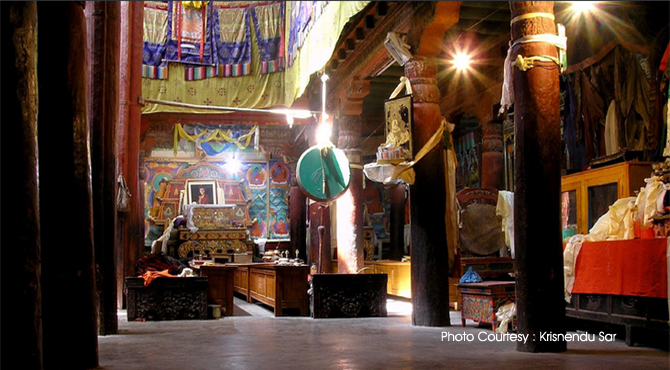 It has about 13 major Gompas (Monasteries) of which 'Hemis' is considered the Gompa of Gomaps. This monastery belongs to Gelugpa sect of Tibetan Buddhism. One of the most important monastery of Ladakh, it is located 40 kilometers south-east of Leh on the west banks of the Indus River. It was constructed by Lama Stagsang Raspa Nawang Gyatso in 1630 and re-established in 1672 by the Ladakhi king Sengge Namgyal. Also known as the Chang Chub Sam Ling or 'the lone place of the compassionate person' it has the patronage of the Royal Family. The monastery has a concealed entrance, a large rectangular courtyard flanked by two big temples. One can see colourful prayer flags and lots of prayer wheels strung across courtyard, rich Buddhist wall paintings, sculptures and the Thanka painting inside the chambers and halls of this monastery. The main chamber, where elaborate prayers and rituals are performed, has frescos dating back centuries. Also one can see tall, wooden panels support an intricately designed roof. The major attraction here is the 15 meters high statue of the Sakyamuni Buddha with blue hair and a statue of Lama Stagsang Raspa. The courtyard of Hemis Gompa is the stage for the famous 'Hemis' festival, that celebrates the birth anniversary of Guru Padamsambhava or Guru Rimpoche. Guru Padamsambhava, regarded to be an incarnation of Lord Buddha. It is believed that Sakya Muni Buddha himself predicted the Guru's birth on the tenth day of the fifth month of the Monkey year. Large number of devotees and tourists are headed towards this Monastery for the three-day Hemis festival. The festival is the time for great rejoicing for Buddhists across Ladakh region as well as many other monasteries elsewhere in India, Bhutan and Tibet. The masked dance performances of this monastery are well-known. The colourful festival falls on the 10th day (Tse-Chu) of the Tibetan lunar month. The lamas practice for the dance and also the Ladakhis make all the preparations for the festival. Local people come dressed in colourful attires and interact with their near and dear ones while the tourists try to learn about the Hemis Gompa to make their visit memorable. The monks from Chemday and Hemis monastery are the main participant monks in the festival. They start practicing the mask dance a fortnight prior to the festival. Splendid masked dances and sacred plays by Lamas called 'chhams' are performed around the central flagpole, to the accompaniment of cymbals, drums and long horns. Guru Padmasambhava, the founder of Tibetan Buddhism is believed to have fought with demons for the safety of the local people. The Lamas wear colourful costumes, i.e. long brocade gowns set off by quaint headgears. Masks worn by the lamas represent various guardian divinities of the Dugpa order, of which Hemis is the leading establishment in Ladakh. The dances end with the ritual destruction of a sacrificial offering of a human figure made of dough by the leader of the Black Hat dancers. The pieces are then scattered in the four directions depicting a re-enactment of the assassination of the Tibetan apostate king Lang-dar-ma by a Buddhist monk in AD842 or cleansing of the soul after death. 'Rimpoche' or the head lama presides over the function. The lamas recite mantras associated with the various episodes of the 'chhams'. The festival takes an auspicious turn every 12 years in the Tibetan Year of the Monkey, when the two-storey high ' Thanka', richly embroidered with pearls and semi-precious stones depicting Padmasambhava is displayed. It is believed that this give good health and spiritual strength. A colourful fair, displaying some beautiful handicrafts, is the special highlight of the festival. The so-called 'devil dances' constitute an important element in the social entertainment of the Ladakhis. The uproarious song-and-dance mirth, created by these mask dances, which invariably depict the victory of the right over evil, is kept by the all-round consumption of huge bowls of 'chang', Ladakhis own country liquor. Timings : 6:00 am to 8:00 pm.